"CA-05" redirects here. For other uses, see CA5 (disambiguation). California's 5th congressional district is a congressional district in the U.S. state of California. California's 5th congressional district - since January 3, 2013. Mike Thompson, a Democrat, has represented the district since January 2013. Currently, the 5th district encompasses much of California's wine country. It consists of Napa County plus portions of Contra Costa, Lake, Solano, and Sonoma counties. Cities in the district include Cotati, Rohnert Park, Santa Rosa, Sonoma, Napa, American Canyon, Vallejo, Benicia, Hercules, and part of Martinez. 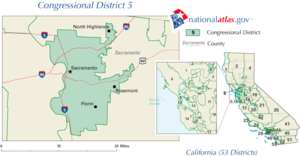 Prior to redistricting by the California Citizens Redistricting Commission of 2011, the 5th District encompassed the city of Sacramento and some of the Sacramento metropolitan area, while most of the territory now in the 5th District had formerly been the 1st District. One of the main characters of the Netflix original series House of Cards, Jackie Sharp, is depicted as representing the district in the United States House of Representatives. John Kerry won the district in 2004 with 61.1% of the vote. The district swung more into the Democratic column in 2008 when Barack Obama won 69.62% of the vote while John McCain received 28.40%. 50th First elected in 1884. March 3, 1891 51st Elected in 1888. March 3, 1893 52nd First elected in 1890. March 3, 1905 58th Elected in 1902. 62nd First elected in 1904. 67th First elected in 1912. 68th First elected to finish her husband's term. June 13, 1926 69th Elected in 1924. 81st First elected to finish Flaherty's term. 88th First elected to finish Welch's term. Resigned to become Mayor of San Francisco. 89th First elected to finish Shelley's term. 97th Redistricted from the 6th district. April 10, 1983 98th Redistricted from the 6th district. 100th First elected to finish her husband's term. 102nd First elected to finish Burton's term. 107th Redistricted from the 3rd district. 112th First elected to finish her husband's term. 116th Redistricted from the 1st district and re-elected here in 2012. Republican Mae Nolan won the special election to replace her husband John I. Nolan, who won re-election but died before the 68th Congress convened. Data for this special election is not available. Republican Richard J. Welch won the special election to replace fellow Republican Lawrence J. Flaherty, who died in office. Data for this special election is not available. Democrat John F. Shelley won the special election to replace Republican Richard J. Welch, who died in office. Data for this special election is not available. Incumbent Robert Matsui died January 1, 2005. In a special election held on March 8, 2005 to fill the vacancy, Matsui's widow, Doris, won the seat with almost 68% of the vote. She was sworn in on March 10, 2005. As of April 2015[update], there are two former members of the U.S. House of Representatives from California's 5th congressional district that are currently living. ^ "California Secretary of State. Supplement to the Statement of Vote. President. Counties by Congressional District" (PDF). Archived from the original (PDF) on October 18, 2012. Retrieved April 13, 2015. ^ "Special Election Results" (PDF). Secretary of State of California. Archived from the original (PDF) on May 29, 2008. Retrieved May 29, 2008. ^ Office of the California Secretary of State Archived December 21, 2008, at the Wayback Machine "United States Representative in Congress, (retrieved on August 9, 2009). ^ Office of the California Secretary of State[permanent dead link] "United States Representative in Congress, (retrieved on March 24, 2011).